The vast catalog of animated creations from William Hanna and Joseph Barbera really became staples to anyone growing up from the late 1950s well into the late 1970s. In those pre-cable, pre-VHS, pre-DVD days, their cartoons, in most cases, weren't "a" choice, they were "the" choice. Hanna and Barbera made their big splash with a plethora of Tom & Jerry shorts in the 1950s, but it was things like The Flintstones, The Jetsons, Ruff and Reddy, Huckleberry Hound, Yogi Bear, Top Cat, Pixie and Dixie, Peter Potamus, Magilla Gorilla (among countless others) that were the entertainment lifeblood of television-addicted youth, of which I was gleefully one. Funny how time has a way of making things seem better than they were, which is really what nostalgia is all about in the first place. 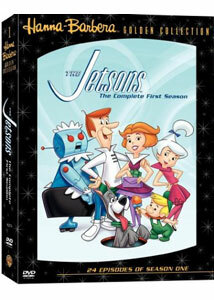 To mine those nostalgic dollars, Warner has uncorked an impressive four-disc slip-case collection of the 1962 prime time season of The Jetsons. The set sports a fairly steep MSRP, but matches the look of the previously released The Flintstones: The Complete First Season, as well as the upcoming Jonny Quest collection, so no doubt Hanna-Barbera-aholics will want the entire library. In hindsight, these were not the greatest cartoons ever made, but they were (and still are) akin to comfort food, and things like the minimalist usage of repeated backgrounds or other minor incongruities were glaring to me even back then. Needing to add this set to your collection on its iconic merits is all well and good, but I think there would be more overall satisfaction if the series was truly funny (which it sadly isn't, despite what you memories may tell you), instead of being only moderately clever. I don't want to pee in the punchbowl, but the show was definitely spotty in the humor department, and as Hanna-Barbera did with The Flintstones—who were happily stuck plying prehistoric family hijinks—the futuristic antics of George, Jane, Judy, and Elroy Jetson went in the other direction. Using advanced technology as a foil for most of the gags was a lightning rod for material; it really was the show's trademark, and instead of funny dialogue, we got wacky futuristic visuals that were intended to poke fun at the modern conveniences 1960s suburban America dreamt about. Episodes about the family buying new car, getting a pet (in this case, a robot dog), or Jane learning to drive were thin thematic threads peppered with space age drivel meant to sell the jokes. Sometimes it worked better than others, but not often enough. It's true that some elements don't seem as far-fetched now as they once did, but things like their cool bubble-topped flying cars (which folds up into a suitcase) or George's bed that pops him out like a toaster were always on my invention wishlist as a kid. But the truth is, prior to sitting down with this first season set, I couldn't really recall any particular episode of The Jetsons, except bits and pieces about the one where Astro's real name is revealed to be Tralfaz (Episode 15). And this is coming from someone who probably saw every episode a thousand times over the years. As a kid I watched the show because my options were limited, not because it cracked me up. As a post-modern nuclear family, I suppose the Jetson clan seemed fairly tolerable, likeable souls. There's nothing blatantly unpleasant about them, but in terms of comedy the humor was always a little forced, and never laugh-out-loud funny. But I did forge some kind of affinity for the characters. As a kid, I really wanted to grow up to be Elroy (voiced by perennial Hanna-Barbera talent Daws Butler), and have my very own nearly-talking dog like Astro (voiced by Don Messick). George (voiced by George O'Hanlon) and Jane (voiced by Blondie's Penny Singleton) seemed like cool parents—slightly absent-minded but well meaning—and who wouldn't have wanted a hip older sister like Judy (voiced by Janet Waldo)? Poor Jean Vander Pyl, best known as the voice of Wilma Flintstone, had the misfortune of being cast as one of the series least consistently appealing characters—Rosie The Robot, the Jetson's faithful maid. For reasons I don't want to go into, I had a problem with her 35 years ago, and I still do today. I don't really want to be too hard the Jetson family, but decades of reruns have pretty much worn the comedic impact of the series down to a nubbin. By no means do I discount the warm fuzzy feelings a series like this can generate—I can relate to the appeal of warm and fuzzy. From where I'm sitting, though, The Jetsons doesn't have any tangible entertainment value all these years later EXCEPT for those warm and fuzzies. The question you have to ask yourself: is that enough? Image Transfer Review: All episodes are presented in their original 1.33:1 full frame. There is some noticeable debris spread across the run of episodes, though colors are reasonably bright. There is quite a bit of shimmer and flicker that occurs fairly frequently, especially on backgrounds, and I imagine this is a result of simple age deterioration. Audio Transfer Review: Audio is provided in a workmanlike Dolby Digital English mono, with character voices completely presentable and discernible. No noticeable hiss, crackle, or glaring audio flaws were evident, and the overall presentation was more than adequate. Extras Review: It's the packaging on this set that helps push it into the B category, up from a C. Even if the actual extras themselves are a little light, the box looks simply beautiful. It's a fold-out housed in a nice slip-case, and the inside is sprinkled with a few Jetsons' trivia questions. The whole thing looks impressive and stately, and like you need it on your DVD shelf. Disc 1 contains a pair of commentaries from Janet Waldo, who did the voice of Judy Jetson, with the tracks recorded for the first two episodes (Rosie the Robot and A Date with Jet Screamer). Waldo sounds like a sincerely nice person, and her comments tend to all be very positive and upbeat, with nothing especially revealing (not that I was actually expecting any, mind you). She touches on Penny Singleton's inability to say the word "robot" correctly, and how the original voice recordings sessions lasted six hours. She also lets on which episode was her favorite, and that she had a crush on Joe Barbera. Judy, you scamp! Disc 4 holds the remaining supplements, starting off with The Jetsons: The Family of the Future (08m:41s), a brief history of the show's origins, made somewhat interesting by the inclusion of interview footage with Hanna and Barbera. The quality of their input is negated by the cheesy voice-over guy. Space Age Gadgets (04m:50s) reflects on the many inventions seen on the series, and while I always wished for one of those toaster beds, modern technology has consistently let me down. Rosie the Robotic Maid (03m:32s) is short puff piece on one of my least favorite animated characters of all time—so needless to say I didn't enjoy it very much. Lastly, The Nuclear Family Album is a bio section of each Jetson family member, including Astro. Rounding things out are a smattering of related trailers (The Flintstones: The Complete First Season, Scooby-Doo, Where Are You? Seasons 1 & 2, Jonny Quest: The Complete First Season, Samurai Jack). Each episode represents a chapter (that makes 24), and subtitles are available in French, English, or Spanish. Like the Flintstones, the Jetsons still stand as some of the most recognizable animated characters ever—no small thanks to decades of reruns—so why quibble with their place in television history? This snappy four-disc set from Warner should appeal to diehards, but it doesn't change the fact that these just are not really the finest moments in television animation. Just some of the most familiar.